There’s no limit beyond the taboo! There are two dimly lit rooms. 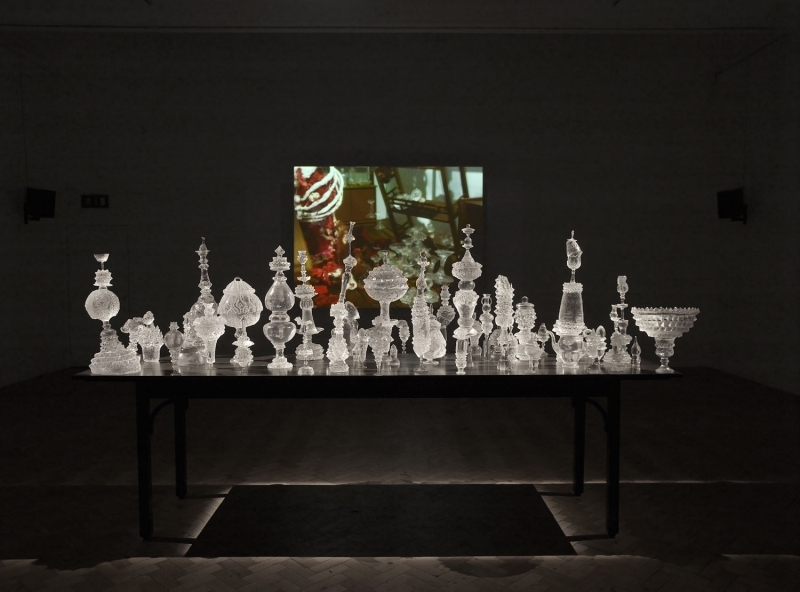 Each contains two large flickering screens at opposing ends and tables with dozens of luminous glass sculptures scattered across them. The whole space is filled with dark atmospheric soundscapes. On the screens, colourful plasticine figurines move in stop-motion, appearing to play childishly in transparent glassy landscapes. Out of the surround sound system, a variety of fragile and dispersed offbeat noises and a deep organic bass swirl around the space. It might feel at first like you have stumbled into a fairytale, but once you recognise the ferocious character of these fictions, it’s going to make your flesh crawl. 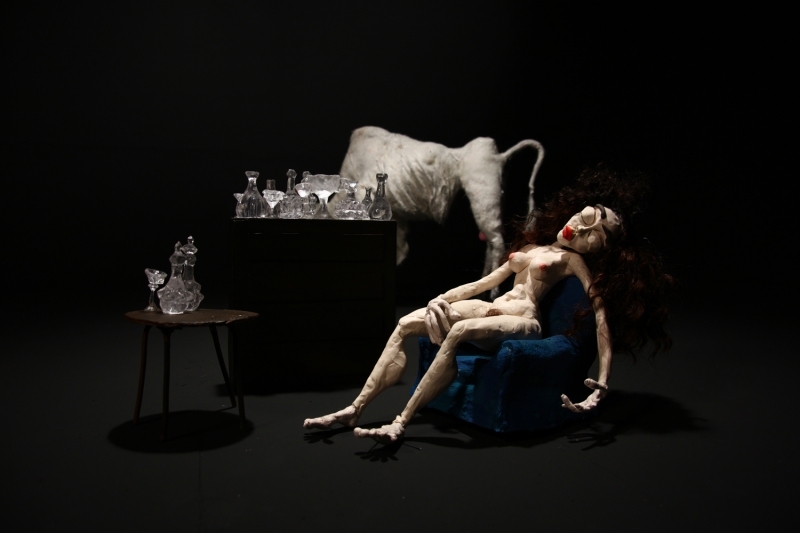 You’ve just stepped into A World of Glass, the current exhibition of Nathalie Djurberg’s new claymation films, accompanied by the music of Hans Berg. Works from the year-long collaboration of these Berlin-based artists have been shown and given awards internationally, most recently at the Venice Biennale in 2009. An audio-visual landscape of four films and one soundtrack, that’s the simple but haunting setting of this cross-media installation at Camden Arts Centre. Djurberg’s stories touch upon highly sensitive topics such as the dark, destructive power of our natural drives and the archetypal relationship between male dominance and female subjugation. They uncover ambivalent clashes between pain and pleasure, temptation and trepidation, violence and vulnerability. It is impossible to maintain a position of distant observation; we are directly exposed to lust for physical contact and a gaze at suffering. And beyond the taboo, there’s no limit. Titles such as My Body is a house of glass, Monster and I’m a wild animal suggest the raw nature of the issues at hand. Apparently, naive animals awake from a somehow unconscious state of mind to suddenly find themselves in the midst of apocalyptic dances where harmless play merges indistinguishably into torture and cannibalism. Such is the nature of these ‘funny games’. 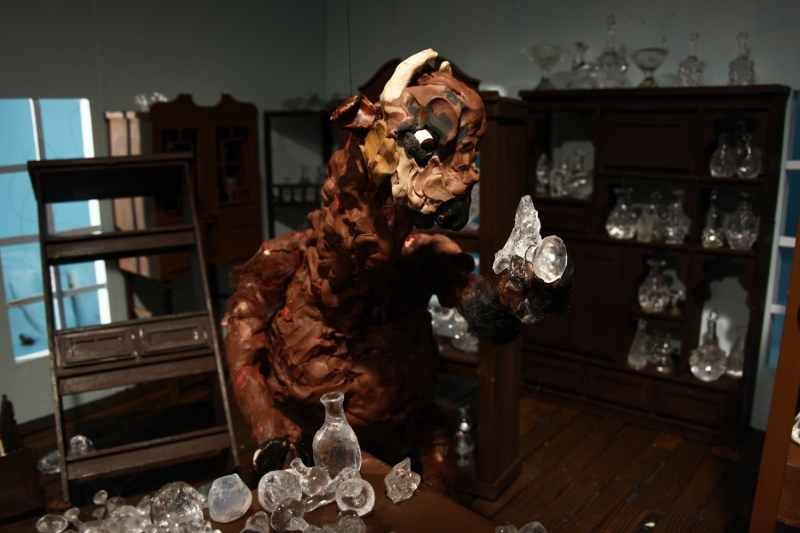 Djurberg is a masterful sculptor, puppeteer, and filmmaker. Her compositions of colour, objects and motion are deeply sensual and pleasing. It’s the puppets’ unconscious beings that compel us to look at these acts of crudest violence. They recall both the grotesque of Shakespeare’s A Midsummer Night’s Dream and the archaic terror of Sodom and Gomorrah. But all morals are suspended in these provocative pieces and no comment whatsoever is provided within the narrative. The whole task of generating emotional intensity lies with Hans Berg and his congenial translation of the static, visual situations into dynamic aural fluctuations. Fragile sounds accompany the silent screams of the puppets and a masterly dramaturgy of sonic vibrations builds a tension of foreboding that inexorably intrudes your body. Ever since postmodernism’s theories of moral relativism, intellectual ignorance, and the ‘truth within the void’ represented our perceived world as a meagre model of the abstract intangible reality; the body has become one of the obsessive rediscoveries of contemporary art. The body as the true scene of human life is a central topic in Djurberg’s work: the body as a fragile shield and source of force, the body as the victim and the culprit, the body as an instrument of will, the body as a burden of want, the body as the painful battlefield of lust and desire, leaving no winners at all but the traces of terror and the remains of rage. Even if you do not care for content at all, but are rather looking for aesthetic stimulation and inspiration, you should not miss this. Merely as an example of high-level animation film and sound-installation, this masterpiece of collaboration between Nathalie Djurberg and Hans Berg is a deeply enjoyable experience.